I would like to touch upon what I consider to be the topmost plant candidates for any butterfly garden. They are ones I've personally had experience with that have withstood several seasons of close observation on my part. These are all deer and bunny resistant in my experience except for Scabiosa, also known as Pincushion Flower. Blooms on Pentas plants were usually nipped off by deer, but not all of the time. My thinking is that Pentas blooms aren't too palatable. As new deer came through, they tasted and moved on. 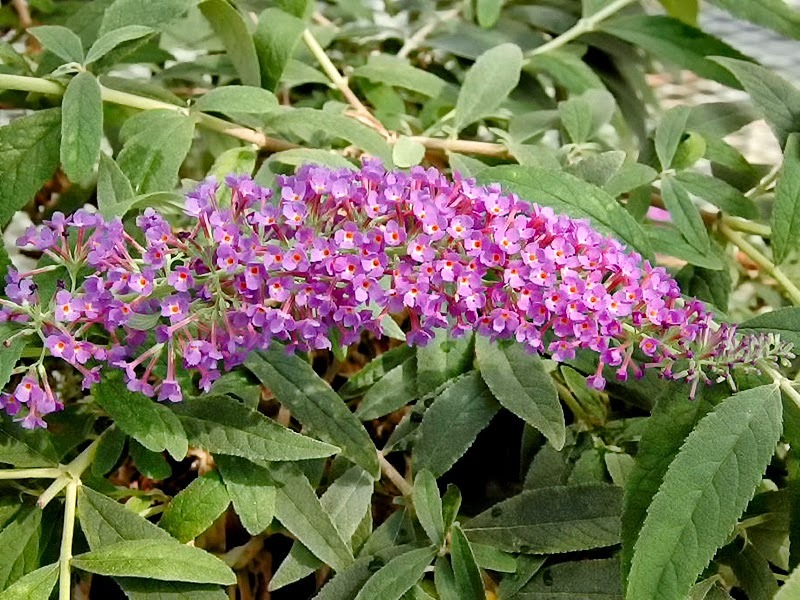 The #1 hands down, slam-dunk, ace in the hole, sure fire, stick it under your cap, can't be beat, butterfly nectar plant is the appropriately named Butterfly Bush. It has never let me down. If I wished to see what butterflies were visiting Alta Laguna Park, I always searched out the Butterfly Bush plants. Butterfly Bush, Buddleia davidii is a rather largish plant that needs some room to grow, the average height being 6 - 8 feet tall with an eventual 4 - 6 foot diameter if not seasonally pruned. There are dwarf varieties offered now that grow to only 3 - 4 feet high and as wide. Plant developers are coming out with even squatter varieties at 2 - 3 feet. The flower clusters faintly resemble lilac blooms, emitting a pleasant sweet aroma of their own. Drop dead easy to grow. The list of the various Buddleia (sometimes spelled Buddleja) cultivars is extensive. From my experience, the pale lavender varieties seem to be the best attractors. "Black Knight", a dark violet flowering selection has not worked very well for me, but others have noted it as being a very successful butterfly attractor in their yards. For those wishing to grow one in more confined areas, dwarf varieties are good candidates for small gardens and medium to large pots. Even the tall ones can be successfully grown in a largish container. I picked up a compact grower, "Nanho Blue" at Green Thumb Nursery in San Marcos. They have a good selection of Buddleia varieties, both dwarf and regular, as I'm sure the other Green Thumb stores would also. How to Prune and Shape Buddleia. Butterfly Bush should be cut back yearly in order to promote next season's flowering, as they bud on new growth. 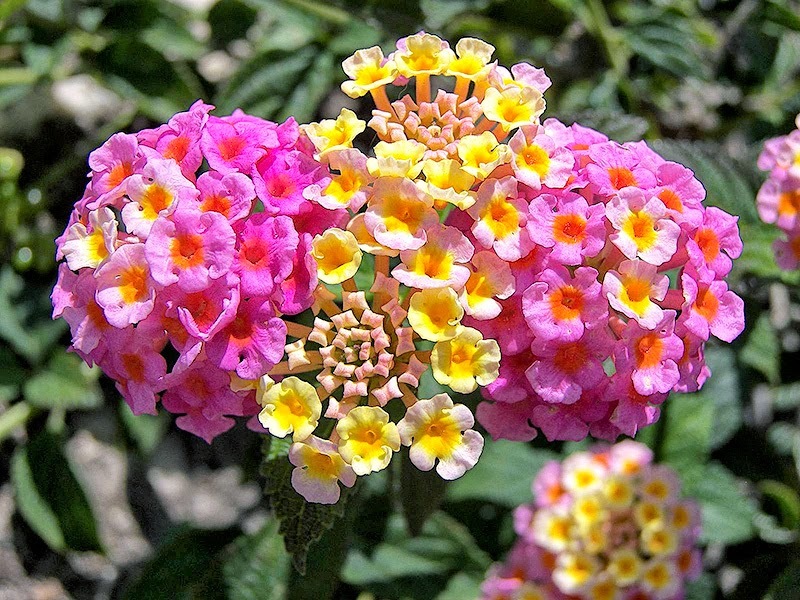 Lantana camara is one of my favorite colorful additions to a garden, irrespective if it is a butterfly garden or not. They sport flowers in the yellow, orange, to pink and red tones. Easy care and maintenance shrub. Skipper butterflies adore these nectar rich blooms! I find lantana "Confetti" to be a particularly good selection for attracting butterflies. 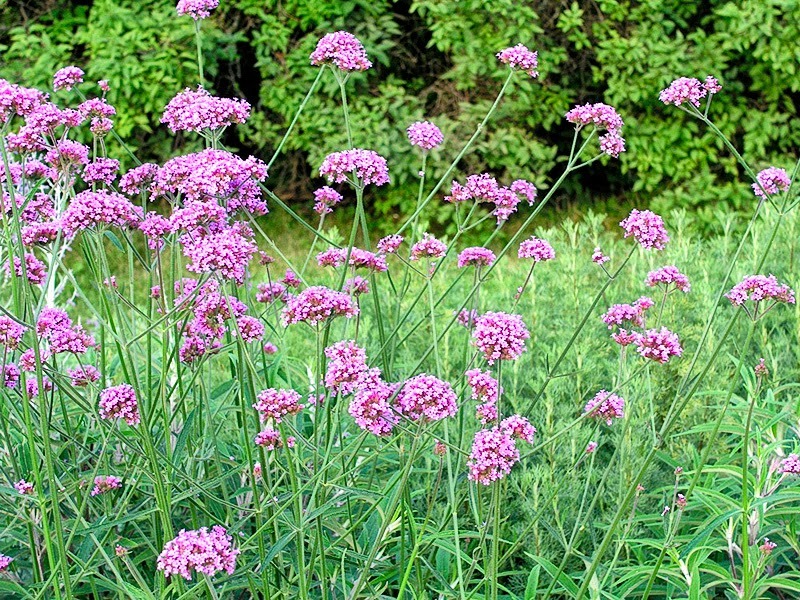 Verbena bonariensis, or more commonly known as Purpletop Vervain is a short-lived perennial packing a lot of butterfly attracting power on the blossoming tips of its long flower stems. Delightfully airy, it makes its self well known without overpowering the rest of the garden. Self sows readily, so you will have a continuous supply of plants to replace aging ones, plus some left over to share with like-minded friends and neighbors. Pentas lanceolata (Egyptian Starcluster) is another must have addition to any butterfly garden. It sports various shades of white, pink, red, and violet-hued blooms. 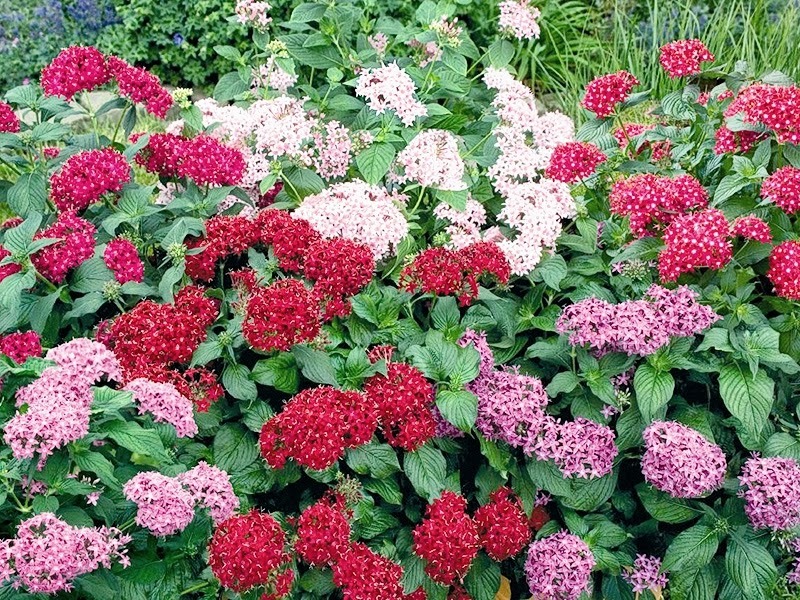 The aptly named "Butterfly" series of Pentas are probably the best variety to purchase for a butterfly garden. The plants themselves are not eaten by vermin... I mean bunnies and deer, although deer tend to bite off the flowers and buds that develop. The old fashioned strains are tops in producing nectar rich flowers, but have a habit of lanky growth and a tendency to be top heavy, which may cause them to flop over without staking or cradling. Beware of many of the newer compact selections offered in nurseries and seed packets today. They are bred for show and compactness, but the flowers are deficient in producing abundant amounts of nectar that butterflies feed on. Informal observations show that butterflies ignore these new varieties without so much as a second look back. The "Butterfly" series is bred for compactness and color, plus has the added bonus of producing copious amounts of nectar. Scabiosa "Butterfly Blue" is a stellar performer in the flower garden. It's nonstop production of pale violet blooms throughout its long active growing season, its ease of care, coupled with a magnetic attraction to butterflies like Justin Bieber is to prepubescent girl teenyboppers, "Butterfly Blue" is a top performer. I did try Scabiosa at the Alta Laguna Park Butterfly Garden, which was the end-all battlefield testing ground for deer and rabbit proofing. Unfortunately, it didn't pass muster, but I'm including it here for its excellent butterfly attracting quality. Any of the various Scabiosa species - more commonly known as Pincushion Flower - are excellent candidates for the garden. Look great in rock gardens, along pathways, and make good potted specimens due to their ease of care, lower than average water requirements, and low, somewhat compact growth. Colors range from white, light blue, light violet, into pink. Highly recommended. Milkweed is the host plant for Monarch butterfly caterpillars. They are prolific nectar sources for adult butterflies in general. There are many species of milkweed plants available, both foreign and domestic. North America is home to numerous species. California alone has many milkweeds that call this state home. 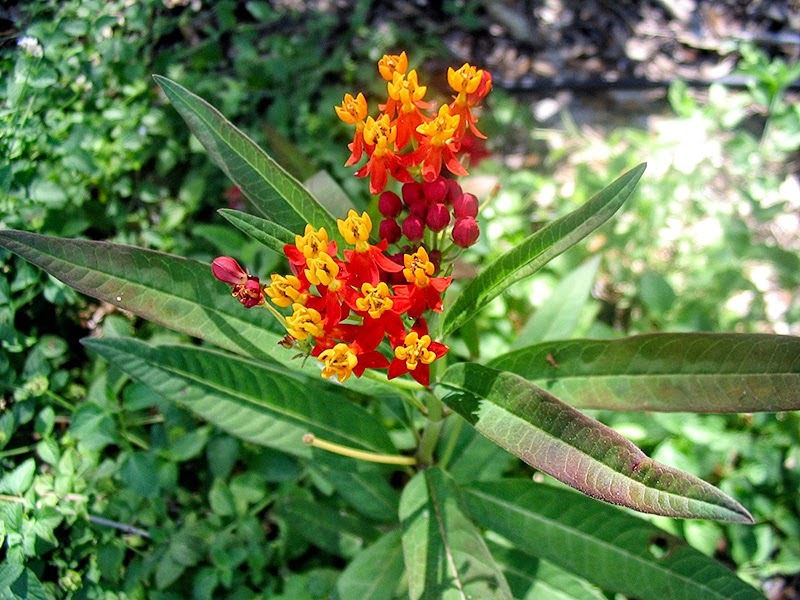 The most common milkweed for butterfly gardens is Tropical Milkweed, Asclepias curassivica from Mexico and Central America. It's a handsome plant that produces orange and red bi-colored blooms. Growers have extended the palette from solid yellow, to orange, and into vibrant orange and crimson bi-colored strains. For those wishing to try a native specie, the most beautiful would be the appropriately named Showy Milkweed, Asclepias speciosa. 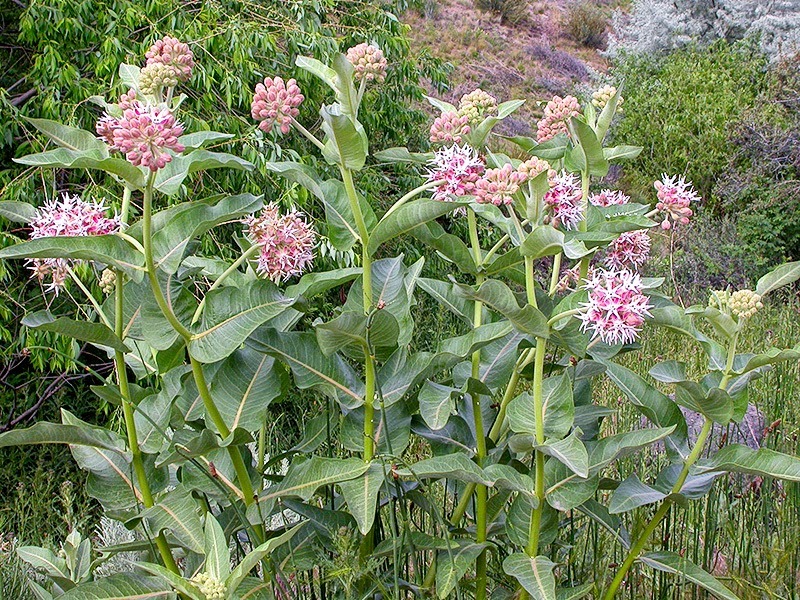 Found throughout much of Central and Northern California and the Western United States, this native sports a large ball of pinkish to whitish blooms that hover over large, leathery leaves. Does well in both average garden conditions and drought tolerant native plant schemes. Very hardy. Deciduous. 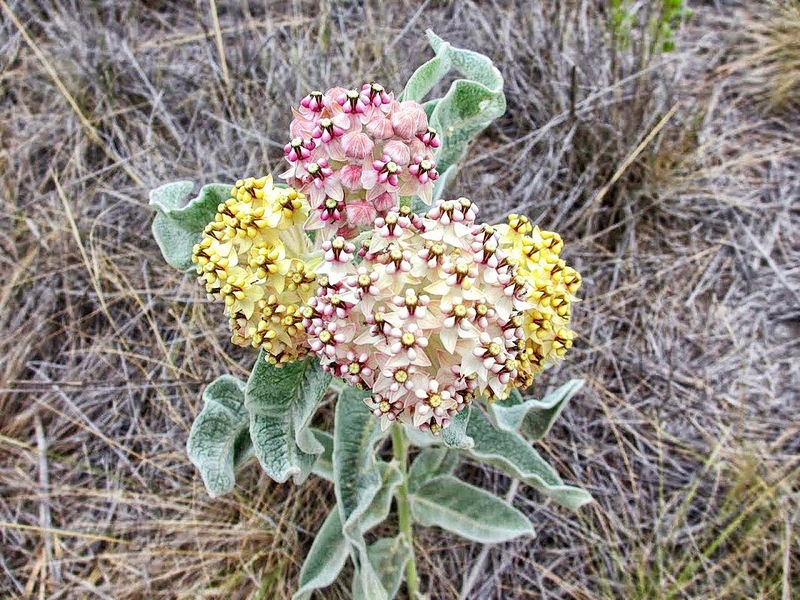 Asclepias eriocarpa, also known as Indian Milkweed or Woolly Milkweed, would be an excellent candidate for those that wish to naturalize this genus on larger properties. It's a native of the western half of the U.S., and can be found growing throughout all of California. Several local areas it grows in known to me are out Laguna Canyon Road in Laguna Beach along the Stagecoach hiking trail that meanders inside the Laguna Coast Wilderness Park, the Santa Ana Mountains, the Palomar Mountain area, the Santa Monica Mountains, the Santa Rosa Plateau near Murrieta, and up in the San Gabriel Mountains. A. eriocarpa grows naturally in many soil types, so it's not too fussy about what it sinks its roots in to. Being a So Cal native and drought tolerant also, this specie would be a prime candidate for naturalizing. 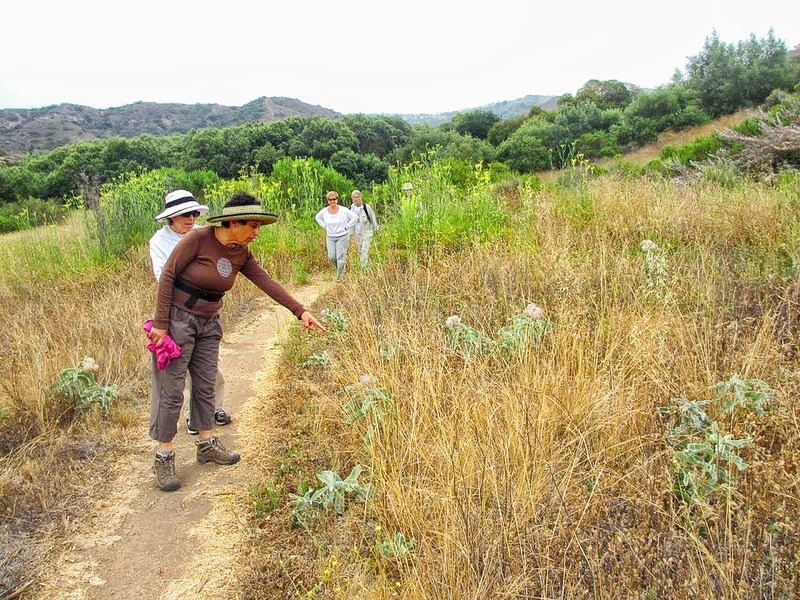 Karen Schweger pointing out Asclepias eriocarpa growing alongside the Stagecoach Hiking Trail out Laguna Canyon, Laguna Beach, CA. The tall, yellow-flowering plants towards the back are Wild Fennel, a good source of nectar for all butterflies, and a host plant for the Anise Swallowtail. Unfortunately, Wild Fennel is considered an invasive species. 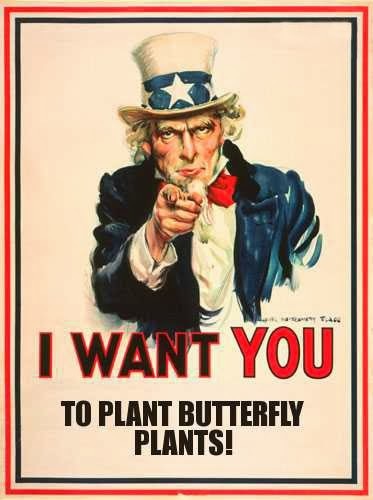 BTW: Green Thumb has a good assortment of butterfly plants, but one must know what to look for. Also check out Armstrong Garden Centers for butterfly plants. In the past, they have ordered and stocked plants labeled specifically for butterfly gardens.